USCIS creates problems not only with work, but also with a driver's license. I do not have a driver's license. A week ago, my husband started have problems with his leg. He practically does not walk (only to the toilet with a crutch). He was hit by a car a few years ago, he has had several surgeries . There are several metal plates in his right leg in the thigh and in the knee, one leg shorter than the other (he uses special shoes). We are engaged in analyzes and X-rays. I plan to file my case speed . Only 5 days was left to request and they make changes again.....( I am 4 October filer). Has anyone heard how quickly such cases can be considered? It isn't USCIS, it's just part of the process with the AOS and the state's requirements of proof of status. The state's requirement has nothing to do with USCIS. Though how illegals get DL's in Cali I'm amazed since seems like everyone else can't. As to your issue right now, you could request an expedite do to possible financial loss because of his inability to curently work, or can always go apply for jobs and if you receive a job offer can attempt to expedite with the offer. No issues with trying that stuff. Also, I do not have SSN , I arrived on a K 1 visa and did not know that I could receive it during the term of my visa. Do you think my case can go in the direction of an emergency situation? (my husband is a pensioner and has no financial losses). My waiting time already 6 month. I need a car to take care about my husband because he is supposed to have another surgery and a recovery period. Thanks. Hard to argue for needing a car when there are so many cities in CA with medical transport services, plus taxicabs, Uber and Lyft. Sorry to hear of this issue. 6+ months for EAD/AP is frankly, unacceptable. It took my wife 4 months to get hers and even that seemed like an eternity. I have a passport. The site is written AND social security number. Does this mean that this is an indispensable condition? I don't have a SSN . Does this mean that this is an indispensable condition? I don't have a SSN . Select "I do not possess any of the documents listed above" and press "Next"
Select "Foreign passport, consular identification card, foreign national identification card, or a foreign driver's license. If the foreign driver's license is in a language other than English, it shall be accompanied by a certified translation or an affidavit of translation into English." and press "Next"
Select something from the list you have then select "Next"
treppenwitz, thank you for your support and valuable advice. Also, thanks to everyone who answered in my topic. I will deal with this process today and will report the results of my story. Perhaps this will help people who are in my situation. Today I visited the office DMV with the purpose of applying for the AB60 driver's license and passing the written test. 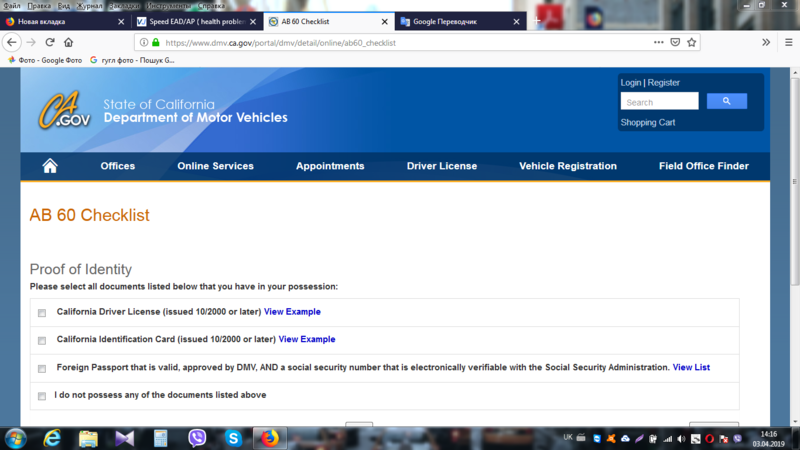 Previously on the site, I passed a special test for the availability of documents, after which they sent me notifications that the documents I have, give me the opportunity to apply for this tipe of driver's license. Even with the successful pass of a written test, the next step is to check all the documents provided. The term of the investigation is 6 months. During this time, you do not have a learning permit (you can not learn how to drive and drive in a car with another person). After 6 month investigation, you have the right to pass the driver's test, if your documets wiil be confirmed. As far as I understood, this program is designed for California's illegal immigrants (this driver's license is only for this state), therefore such a waiting period.